Top, members of the Newmark lab. 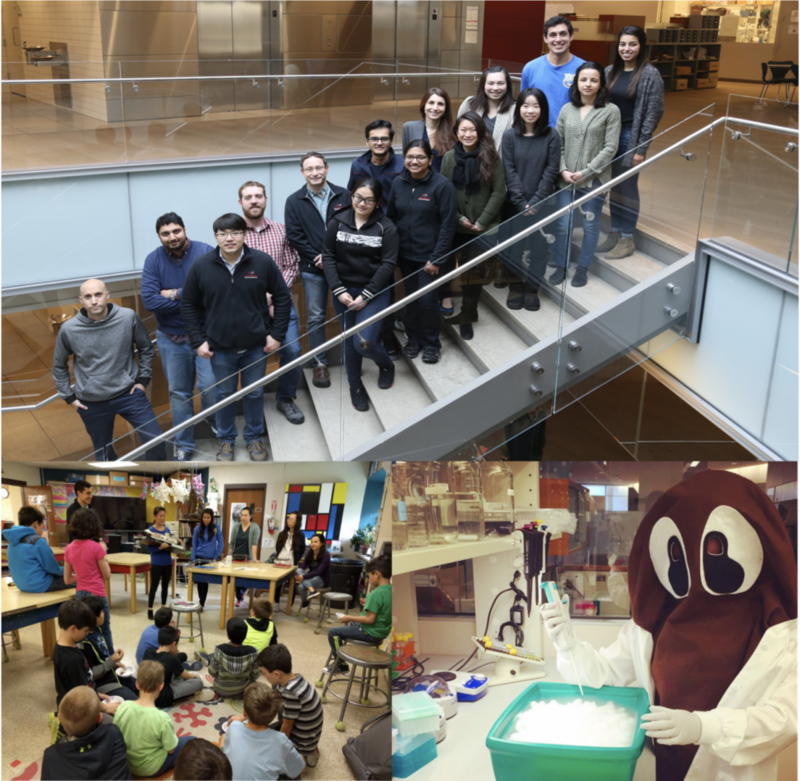 Bottom left, members of the lab at a local elementary school talking about planarians. Bottom right, lab mascot, Schmidty, aliquoting cells. Phil first became interested in planarians in his freshman biology class. This interest was regenerated as a graduate student when reading a paper in journal club2. After completing his PhD, he followed his curiosity and moved to Barcelona, Spain, to work in a planarian lab. At the time there were no planarian labs in North America, therefore Phil gathered planarians in thermoses and brought them to Alejandro Sanchez Alvarado’s lab at the Carnegie Institution for Science in Baltimore, MD. Together with Alejandro, Phil began to establish a molecular toolkit including RNA interference to probe planarian biology. Using these tools biologists began to worm out answers from planarians and understand how they regenerate any part of their body (from brain to germ cells)! With tools in hand, Phil established his laboratory at the University of Illinois at Urbana-Champaign. Through the years the lab opened their own can of worms. Asking questions such as how planarians regenerate their germ cells, which only a few animals can do, will help understand the causes of infertility or germ cell tumors. Taking lessons from planarian biology, the lab expanded toward exploring parasitic flatworms such as schistosomes and tapeworms. Living in blood vasculature, schistosomes are responsible for causing schistosomiasis, a neglected tropical disease which affects millions of people in developing countries. Schistosomes lay hundreds of eggs per day in humans; these eggs get lodged in organs and irreversibly damage the tissues. Consequently, the reproductive output of these worms is one cause of pathogenicity and transmission of the disease. Former post-doc, Jim Collins, showed schistosomes possess somatic stem cells that presumably contribute to prolonged survival within their host (these parasites can live for decades). Therefore, by understanding the biology behind flatworm reproduction and stem cells, potential novel ways of targeting these parasites will be uncovered. In August of 2016, with thermoses full of planarians, the lab arrived at University of Wisconsin-Madison and massively expanded their planarian colonies at the Morgridge Institute for Research. At UW the lab enjoys the exciting science occurring on campus. So much that Phil partnered up with professor Anne Griep to organize the Developmental Biology Student/Postdoc seminar series. In addition, assistant scientist, Melanie Issigonis, also initiated the Morgridge/WID Seminar Series (Contact Krista Pham, KPham@morgridge.org, if interested in either seminar). The lab looks forward to getting to know the people behind the science at the happy hours that follow. We highly encourage everyone to attend – there’s free food and beer! With experiments up and running, and planarians regenerating, we are excited to continue to learn about these remarkable animals in their new home. Along the way we also enjoy teaching the public, especially the young scientists in the community, about planarians. For more information about the Newmark lab and research, visit: https://morgridge.org/research/regenerative-biology/newmark-lab/. Brøndsted, H. V. (1955). Planarian regeneration. Biological Reviews, 30(1), 65-126. Baguna, J., Saló, E., & Auladell. (1989). Regeneration and pattern formation in planarians. III. that neoblasts are totipotent stem cells and the cells. Development, 107(1), 77-86. Newmark, P. A., & Alvarado, A. S. (2002). Not your father’s planarian: a classic model enters the era of functional genomics. Nature Reviews Genetics, 3(3), 210. CMB students win NSF fellowships!